Perhaps it was the forecast of a cold day which led to only five people showing up for a post-Thanksgiving hike. At the high school parking lot, I mentioned that I had seen someone on Barracks Road who looked familiar, and before leader Liz Lyons gave the depart command, we did see John Brandt appear on foot. Not long after starting uphill on the trail, many of us found we were not as cold as expected, especially with our brisk climb, so we made a delayering stop. We postponed a possible trip to Furnace Mountain summit until our return and continued up to Blackrock. A little breeze dissuaded us from climbing to the top, so we instead took shelter in the rocks below. Although Thanksgiving was only two days earlier, several people decided that we should eat pumpkin cake. 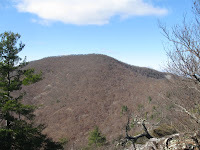 By now, occasional clouds and breezes brought the low temperatures that were forecast, which may be why no one was eager to walk another mile to Furnace Mountain summit and back. This hike usually feels harder than expected for its length, probably because of the total climb and the length of rocky sections. In Charlottesville, Hurricane Sandy seemed just a windy day with more rain than normal for one day, so my first reaction was that nothing happened to trails. However, a week later Staunton River Trail looked like a min-derecho, so I thought our section of AT might have received some storm damage. Marian Styles joined me on an inspection of the AT between Rockfish and McCormick Gaps. 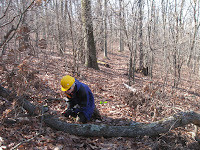 Although the entrance station ranger did not have any damage reports, we found ten trees down. Most were dead or had some decay, and none was a serious obstacle. Nevertheless, we cleared these aesthetic problems by means of sawing and dragging. 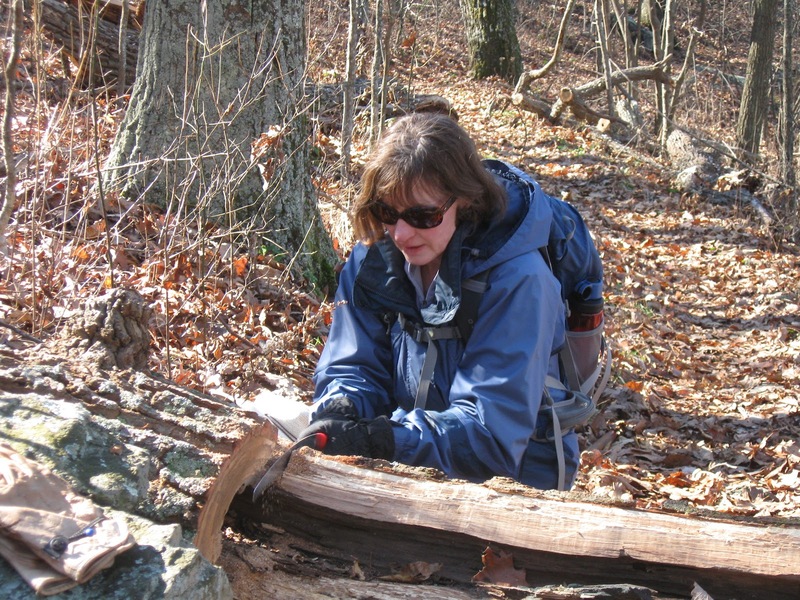 We left one easily-stepped-over, solid ten-plus-inch log, which we could not have moved even if we had finished cutting through it. As usual, our work involved some minor clipping, and some of the trees that fell during the derecho had moved so that they now needed some pruning. It is always invasive plant season; today we encountered a few Oriental lady’s thumbs with seeds on, but so few relative to the many earlier whose seeds have fallen that it was not worth pulling them. And now garlic mustard rosettes were all along the trail, preparing for next season. On a social note, halfway along the trail we met a former SNP Central District manager, Melanie Perl, who was hiking north. What a beautiful day for a hike! It ended up being warmer than people thought it would be. We ended up shedding layers when we first arrived at Reeds Gap parking lot! The parking lot was crowded. Apparently other people had decided to take advantage of this good weather to hike. We had a nice group of 12 people on the hike. Clai Lange was a new hiker to our club. It is always nice to see new faces. We hope she felt welcome and will return to hike with us another time. She really enjoyed the good weather and great views. Leon Gorman brought Bailey and she fit in well with the rest of the "hiking" dogs we saw on the trail. Dennis Templeton joined us. It was nice to see him again. We had a challenging start going uphill on the A.T. and climbing over Bee Mountain. The fall leaves were on the trail and there were good views all around. Pat Skelly and Liz Lyons kept up a good pace as we made our way to Hanging Rock overlook for lunch. Hanging Rock gave us a beautiful view as we ate. Ken Moss brought out a nice bag of Reese's Peanut Butter cups ( three types of chocolate) and John Shannon brought his usual wonderful cake to share. After lunch, some of us decided to climb another mile to the summit of Three Ridges. We did see some snow on the ground on the way up. 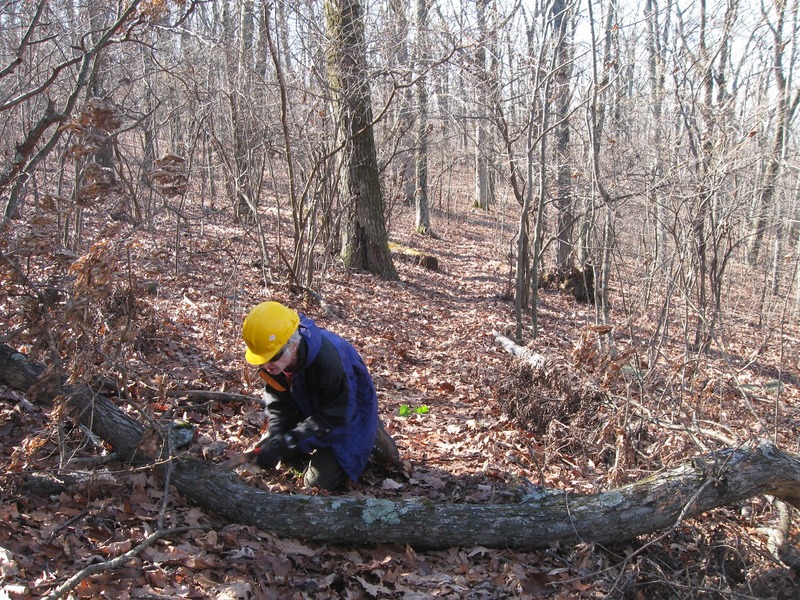 However, there were no trees down to block our path so our saws stayed in our backpacks! The terrain was a little rocky as we climbed. On the way down the path from the summit, C.J. Woodburn and Dan Ralston decided to pick up the pace a bit to lead the way. Marian Styles, Briana Taylor, and Paige Madison had a nice walk together discussing the new movie theater in Charlottesville. Everyone made it back to the parking lot safely. Our hikers should get a good night's sleep after the climb today! A big THANK YOU for all the support we receive from the members of this club. They really appreciate the hike leaders and the drivers getting us to and from the trailhead. It looked like it was going to be a nice day for a hike -- despite the weather earlier in the week. Nine people met at Albemarle High School and Ken Moss met up with us at Graves Mill Parking Area. Beverly and Pete Fink were able to join us. We are glad that Pete is doing well after his stent placement. 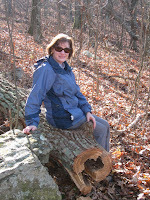 We started the hike and were met with trees that had blown down because of Hurricane Sandy. 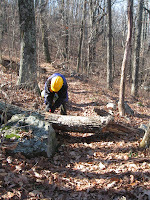 Thanks to John Shannon, saw leader, and others, we were able to clear the trail on the way up to the overlook. Anne Colgate was able to loan us her saw as well. NEVER underestimate the power of a Corona hand saw!! As we made our way to the top, the weather became colder and windier. We only saw a little bit of snow, however. There was quite a bit of snow on the mountains around us. Before we made it to the overlook, John Brandt decided to take a detour to Jones Mountain Cabin. He said it looked warm with smoke coming from the fireplace. Some people braved the weather and decided to stay in the cabin. John quickly joined us back on the trail. We had a nice lunch at the overlook. The decision was made to sit behind the rocks, instead of on top, to avoid the cold wind. Pete Fink and Lindsey Brown provided us with candy. John Shannon brought wonderful pumpkin cake. These additions added a great touch to our lunch "cuisine!" As we made our way back down the trail, Andy Wilgruber and John Brandt decided to take the side trail to Bear Church Rock. The rest of the group, including Joann Davis, Ken Moss, and Liz Lyons, decided to stick with the warmer route and continue to move along the trail. Because of our tree clearing work on the way up, we were able to move at a good pace down to the parking lot. Good weather and beautiful surroundings with hiking friends made this a great day! The end of October can be prime time for hiking in Central Virginia, and this day was no exception. We were fortunate to have none of the predicted rain, though clouds may have kept less dedicated hikers away. However, the hike up and down the backside of Old Rag did bring out 13 enthusiastic hikers. A special guest this day was my Dad, Sherlock Gillet, who was visiting from Maryland and was eager to see the view from Old Rag that we Virginians all rave about. Also hiking were Bev and Pete Fink, David Ledbetter, Paige Madison, Barb Wilson, Bill Holman, and Karen Ramsey. 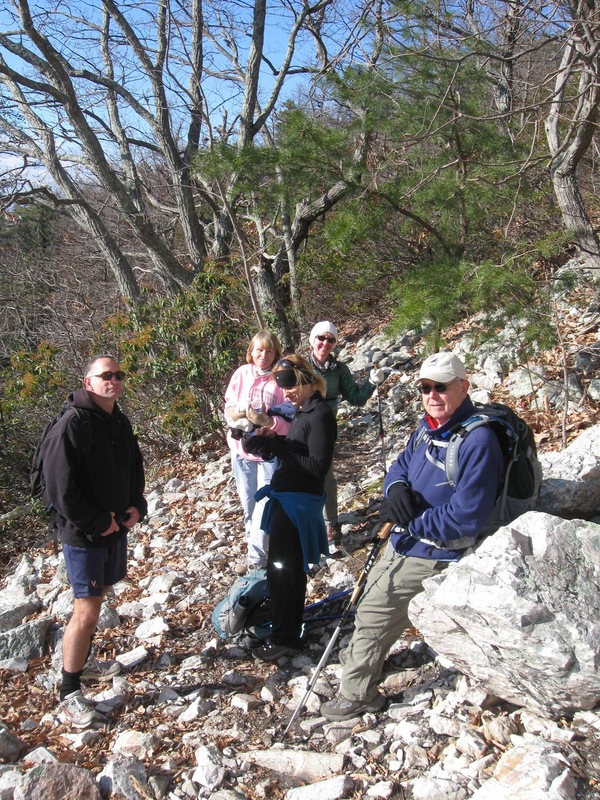 Upon arriving at the parking area we were met by Ken Moss, John Shannon, Marian Styles, and Briana Taylor, so our hearty group of 13 began the gradual ascent up Old Rag along the Berry Hollow Fire Road. Even this remote and far less utilized parking lot was full this day, as so many were eager to get into the mountains and enjoy the end of the autumn glory. Up we went pausing occasionally for breaks to catch our breath and enjoy the beauty. As weclimbed the trail to the summit, and the trail narrowed from its former fire road width after the shelter, it was clear we were swimming against the tide. As this is the path taken by circuit hikers when they descend Old Rag, we met hikers of all ages who were glowing with the exhilaration that comes from the strenuous climb and jaw-dropping view. 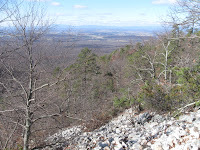 We threaded our way to the summit, gathering for lunch on our customary rock looking toward Hawksbill and the Skyline Drive. We enjoyed our sustenance and were treated to cookies, chocolate, and John’s delicious cake as a reward for our perseverance. It was crowded at the top as often in the Fall on a lovely day, and despite the clouds that had been threatening us, the view was distant and clouds high, providing us the awe hat commanding vistas inspire. We packed up our goods and retraced our steps, now moving with the crowds. Not in a hurry, we descended continuing to soak in the natural beauty. With other Saturday night obligations, Karen, Barb, Paige, John, Marian and Briana headed back to Charlottesville. Upon completion of our 5.5 mile route, the other half of us continued to Ducard Vineyard for wine tasting and music on the patio a few miles from Old Rag. This boutique winery provided a post hike treat for wine tasters Bev, Pete, Ken, David, and Iva. YUM! We enjoyed a great selection of wines prior to our return. We were fortunate to have had a day where the weather cooperated, the views were vast, the leaves were showy, and the wine inspired. It doesn’t get better than this! 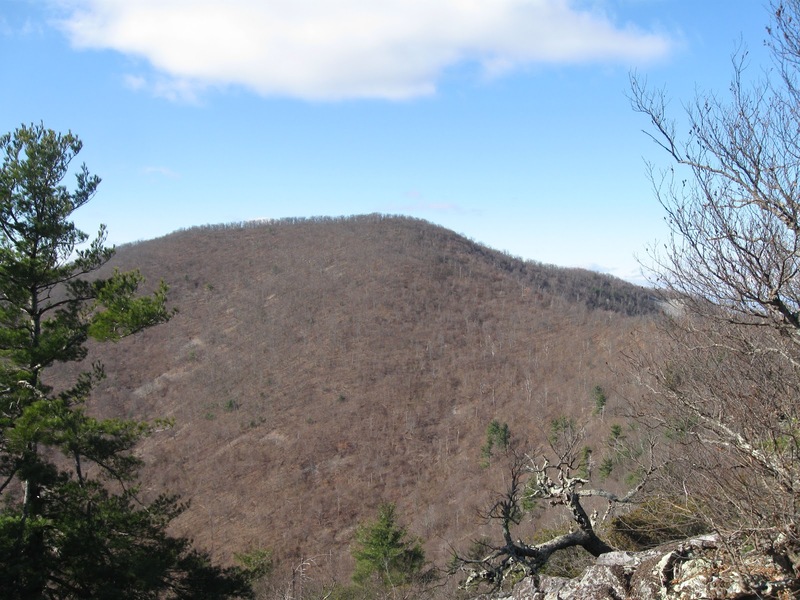 After a chance conversation a few months ago, Alpha Phi Omega service fraternity at the University of Virginia offered to help with the Appalachian Trail. So the morning of October 20, six students (four women and two men) arrived at a cool, breezy, Beagle Gap, while some of their colleagues went to other projects. Mark Gatewood, crew leader of the Flying McLeods, walked the recently completed section of AT from Beagle Gap to Little Calf Mountain and noticed some spots where the trail could be improved from good to perfect. The volunteers offered to carry tools for the two older Flying McLeods to ensure that we had plenty of McLeods and Pulaskis. 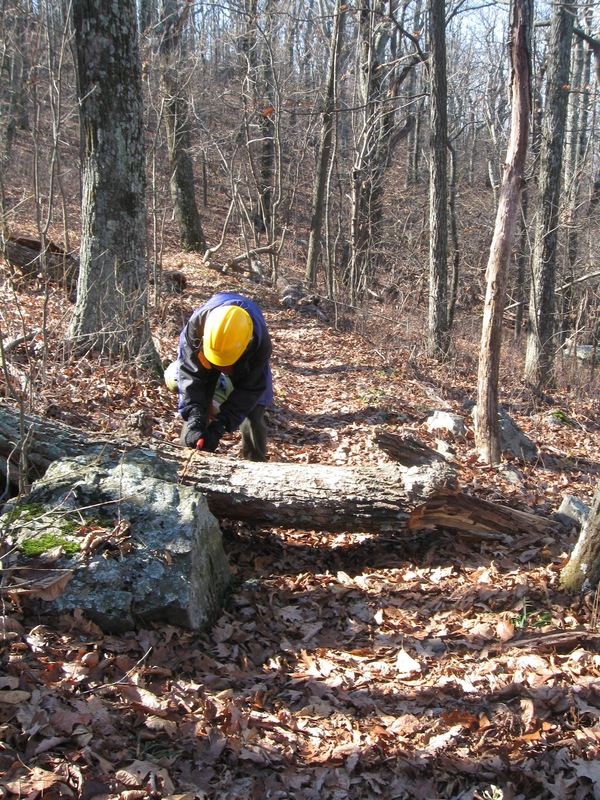 In the first section of trail, the outslope made walking a little uncomfortable in some spots; the group divided up into twos and threes to improve these sections. Mark Gatewood noted that the students quickly learned what needed to be done. We then headed to the summit so the volunteers could enjoy the view before stopping at some hairpin turns where previously the summer heat made it difficult to complete the desired water runoffs. Today, the settled earth and pleasant temperatures made the work easier. Besides moving earth, two of the volunteers removed a large rock whose above-ground tip interfered with a runoff that I had started. The volunteers’ schedule meant we could not complete all these improvements, but their efforts will make finishing easier. Before leaving, the students helped clean tools and discovered the joys of pumpkin cake. Mark commented, “What a great group” because they learned quickly, worked eagerly, and listened to the little speeches that Mark and I gave. After the students left, Mark and I found some branches to put over the old section of Appalachian Trail to discourage its use. After that, I headed to McCormick Gap and Rockfish Gaps where the waterbars needed little clearing. There seemed to be some progress in reducing some invasive plants in a couple of spots, but growth in other areas. Bittersweet may have contributed to the death of one large tree.